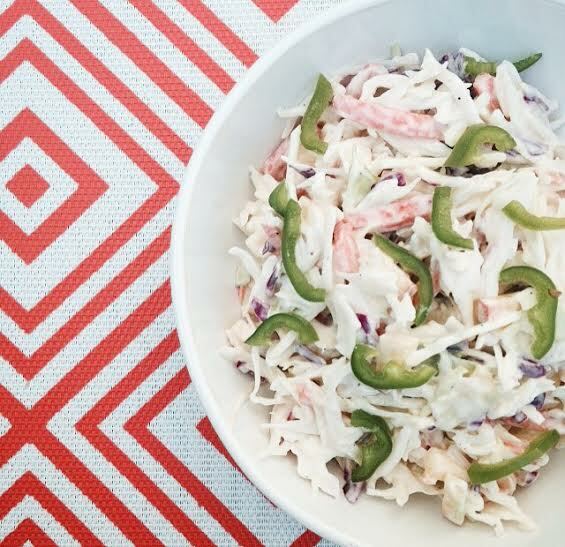 This slaw gives you that sweet, spicy and creamy taste. It’s simple to prepare and goes great with any meat or poultry dish. I served it with my pulled pork sandwich which was a huge hit at a BBQ. You can also substitute mangoes in place of the peaches. In a large bowl add mayo, sour cream, s&p, vinegar and lime zest. Whisk until creamy. Next add the slaw, jalapeños and peaches. Toss everything together until well incorporated. I don’t usually care for slaw, but this sounds wonderful! I have a new food blog too! Please check it out at insidekelskitchen.wordpress.com. Sounds good to me. I love a good slaw and the addition of spicy and sweet are yummy. This looks good! Who doesn’t love sweet and spicy! Great recipe! !